18-year old Japanese golfing sensation, Ryo Ishikawa, is commanding a lot of attention these days and not all of it is welcomed by him. During the recent Japan Open Golf Championship (Oct. 2009), not only did he have to contend with the sounds of multiple shutter sounds from camera phones (apparently the Japanese golf spectators have a lot to learn about etiquette on the course), but then a lady walked off with his ball in play. He had hooked his ball into trees and while it was still rolling she ran after it picked it up and strode off. Other spectators saw what had happened and started shouting at her causing her to panic and start screaming. She was quoted as saying, "I am a fan of Ryo and this is the first time I've been to a golf tournament. I really don't know the rules and I just tried to take the ball home as a souvenir." Frankly, I am surprised that this type of incident doesn’t happen more often at Tour events around the world. We live in an increasingly celebrity-centric society and the world’s leading golfers are becoming as recognised and revered as any other superstars. Some fans are desperate for an enduring memento of their idols whether it is an autograph, a ball or a glove. Let’s hope that it doesn’t move on to their shirt, sweater, or even clubs! So, when the rolling ball was picked up by a spectator what was the ruling? Although this bizarre episode was widely reported by golfing journalists none that I read went on to explain how Ryo had to proceed, and it’s not a straight-forward situation. The first point to note is that In the Rules of Golf the lady spectator was an outside agency. The second is that she purposely stopped and picked-up the ball. "If the referee or the Committee determines that a player's ball has been purposely deflected or stopped by an outside agency, Rule 1-4 applies to the player." "Q. A player overshoots a green. A spectator (X) who is standing behind the green deliberately deflects or stops the ball. According to the Note under Rule 19-1, equity (Rule 1-4), applies. What is the equitable procedure in this case? A. In a case where the ball might have come to rest where X was situated if he had not deliberately deflected or stopped it, the player should be required to drop the ball at the spot where X was situated. For example, if another spectator (Y) had been behind X, the ball might have struck Y, if X had avoided it, and come to rest where X was situated. If there is no question that the ball would have come to rest somewhere else if X had not deflected or stopped it, the Committee must make a judgment as to where the ball would have come to rest, giving the player the benefit of any doubt. For example, if no person or object had been behind X and without any doubt the ball would have come to rest either in a lateral water hazard behind the green or in the rough just short of the hazard, the Committee should require the player to drop the ball in the rough just short of the hazard." "If the ball is not immediately recoverable, another ball may be substituted." Now, I am sure that many readers are thinking that this above Decision is irrelevant to them as there are unlikely to be any spectators deflecting or stealing their golf balls. True, but the same Rulings apply to other outside agencies, including fellow competitors, players in other groups, dogs, birds, and even kangaroos. The only difference is that, in the absence of a Rules Official or Committee member being available, the player should agree where to drop their ball with their marker in stroke play or opponent in match play. “If a ball at rest is moved by an outside agency, there is no penalty and the ball must be replaced." 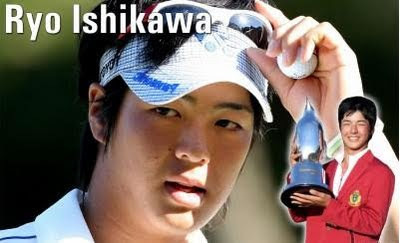 Finally, what happened to Ryo Ishikawa after the incident I opened with? Well, he recovered his poise to finish level with two other players but was then beaten in the play-off. It was Ishikawa's second consecutive runner-up finish at the Japan Open and left him at the top of the Japan Tour money list with 139 million yen (1.5 million dollars). Not too bad for a teenager! Subscribe to this blog on the Rules by entering your email address at the top right of the home page. I promise that your details will not be shared with anyone. Unfortunately, this happened several times and was caught on television this year on the PGA Tour. Both times that I saw it, it was a woman or a kid who just didn't know any better. One woman looked like she had never seen a golf ball before and tried to show it to her husband...who was duely mortified. Luckily, it ended up as a no harm - no foul situation and they just replaced the ball where it was. You are right about Rule 18-1. The key point is that *the* ball must be replaced. If a dog (say) picks up the ball from a known position and runs away with it, so that the ball is not immediately recoverable or not recoverable at all, it seems rather harsh that *a* ball cannot be substituted and that the player is required to take a penalty under Rule 27-1. The player does not seem to have an "out" under Rule 15-2, and there are no equity decisions (Rule 1-4) addressing this point. Allowing the player to substitute a ball in equity would seem to be a fair decision. "If a ball to be replaced under this Rule is not immediately recoverable, another ball may be substituted." So, if it is known that a ball was stolen by a dog and the ball cannot be recovered, then the player may replace another ball at the place where it was lifted from. If the ball was still moving and was off the putting green when the dog picked it up the player should place the ball, if it is recoverable, or another ball if it is not, without penalty, as near as possible to the spot where the original ball was when the dog picked it up, Rule 19-1.